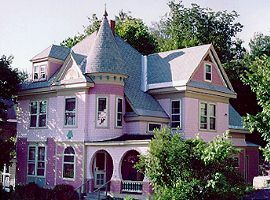 This Queen Anne Victorian Bed and Breakfast with lovely turret and horseshoe arches, located in Vermont's largest historic preservation district, is within walking distance of downtown Montpelier and Vermont College. Bay windows, carved woodwork, high ceilings, lace curtains, wood floors and lavish antiques add to the authenticity. The atmosphere is relaxed and casual. Guests are invited to linger over a cup of coffee in the sun-filled dining room; chat by a crackling fire in the formal parlor; lift weights or cycle in the exercise room; or enjoy the porch with rockers. All rooms have a private bath and cable TV and telephone, suites are available with separate kitchen and living/dining room. A full breakfast is provided; guest favorites include migas (scrambled eggs with green chiles, cheese & tortilla chips) and orange pancakes..
Rates: Seasonal rates from $70 to $140 per unit. Visa, Mastercard, American Express & Discover accepted. Children welcome. This and other Montpelier Bed and Breakfast Inns can be found here in The Register.